If you spend a considerable amount of time with your computer’s keyboard, then it makes sense to learn touch typing (type without looking at the keyboard) While it can be intimidating to look at the jumbled letters on a QWERTY keyboard, there are plenty of software available in the market to help you get the hang of it. The average typing speed usually represented in Words per Minute (WPM) is 40 while professionals are typing away around 75 WPM. 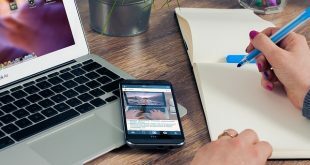 If you are below average, you need to up your game and if you are an average, it could save you a lot of time while writing a report in your office, if you were a professional level typist. It is a useful skill to invest time and money into. For the purpose of this guide, I looked at features, usability, UI, and price while comparing the below touch typing software. Typing is one of the oldest touch typing software provider on the Internet. A free resource that was developed for both students and teachers in mind. 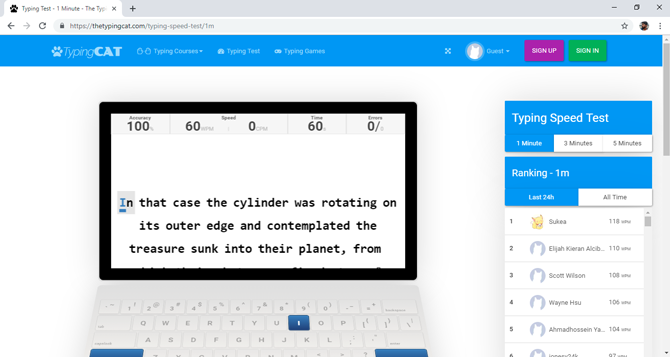 Although the number of lessons, tests, and features is a little less than some top paying software, it is nonetheless an amazing resource to learn touch typing. Typing.com offers 45 courses which come with 8 fun games to take part in which are ideal for beginners to advanced level students. Teachers and students are assigned separate logins which allow the former to assign tests, set goals and provide grades to the latter. Teachers can then follow your progress and guide you accordingly. You can take a typing test and play any game without having to create a login ID, but I recommend you do it to take full benefit of this free resource. The interface is simple and easy to use, making it one of the best free resource available. There is no need to download any software, so you can learn and test your skills on any OS with any browser. Bottom Line: Typing.com offers a simple, easy, and free way to learn and teach touch typing skills anywhere, anytime. Rapid Typing is a Windows-based touch typing software that is licensed as Freeware. It is available for both 32 and 64-bit computers running Windows XP to 10. There is a portable version available. 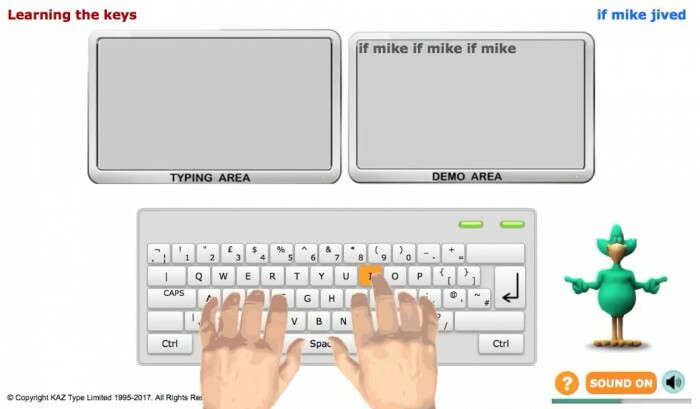 Rapid Typing was built to be easy to use software to help users learn how to touch type fast. There are three modes available: Beginner, Intermediate, and Expert. At the end of each lesson, you will receive ratings which will contain WPM, characters per minute, accuracy percentile, and errors. There are options to choose from font size and type, enable sounds, change lesson view, reconfigure hotkeys, and choose a theme. Rapid Typing organizes many of its lessons around keyboard groups that should help you learn how to touch type quicker. If you are not happy, you can customize or add your own lessons with the help of Lesson Editor. Bottom Line: Rapid Typing offers a colorful interface and plenty of flexibility when choosing and editing your lessons. It is available in several foreign languages and offers different keyboard styles. Typist is a minimal looking touch typing software that is available for free for Mac. It offers 9 courses to choose from. Each of these course has a number of lessons. I found the instructions to be very detailed and the number of lessons is sometimes more than 10. Your stats are shown in real time at the bottom of the screen. In the Preference section, you can turn off sound, change the background color, and choose typing styles. If you have a little time at your hand, there is a quick course that will take you through the basics. Bottom Line: Typist offers a minimal touch typing experience that will get the job done. If you are looking for free software, this is it. Tux Typing is the touch typing software with the coolest game to offer. To make things even better, it is cross-platform and supports Windows, Mac, Linux, and FreeBSD. You will see letters falling from above and a penguin relaxing below, sipping a pina colada. Your job is to catch all the letters before they hit the ground. 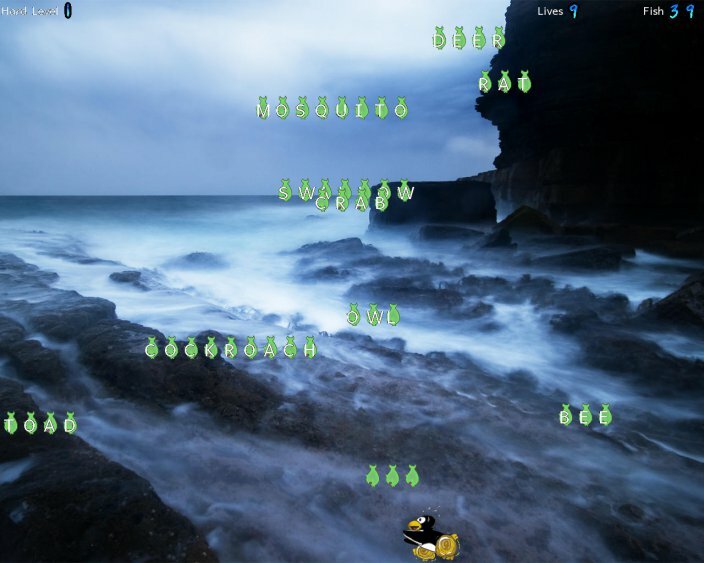 When you start typing, you can see the penguin running frantically across the screen to get to the letters. It’s like Tetris but only funnier. There is one more game available where once again, in a different setting, you have to catch the letters. The speed will eventually increase making it harder to catch and destroy letters using the laser beam! It is fairly simple but fun which should get your kids start typing. There is a practice mode and the software supports multiple languages. Bottom Line: Tux Typing offers the best gaming experience and is an amazing touch typing software tool for your kids. The only drawback is that there is no ratings or statistics offered, but that was not why Tux Typing was created. Typing.com offers a number of games that you can choose from but is not available as downloadable software. Check it out. Ratatype is a web-based typing app which teaches you to tough type efficiently. It uses a reward-based model to help you type faster. You can create high scores and share them with your friends. You can start using the service by creating an account using your email ID or Facebook. It creates a dashboard where you can keep track of your progress. The courses are easy and you can start by completing small courses like learning key positions, finger placement, and muscle memory. The learn section tells you about the perfect posture to type, home keys, etc. It is recommended that you don’t put too much pressure on yourself while learning as muscle memory takes time to update. The typing tests are easy and really help you in improving your typos. The test alerts you at the word where a typo was made and you can go back to correct it. Bottom Line: Ratatype is a decent typing tool aimed at improving kids’ typing. You can use it on any platform with just a web browser. Klavaro is a comprehensive software for Windows which helps you improve your typing skills. It doesn’t have a fancy user interface and it still manages to be easy to use. It has five levels with 50 lessons each which would train your brain extensively. Level 0 is the basic which teaches you basics like finger placement and level 4 has complete texts. Klavaro has multiple languages inbuilt and you can simply choose one from the menu and start practicing in that language. You can change the keyboard layout to any country’s standard layout and choose between QWERTY, DVORAK, COLEMAK, etc. Bottom Line: Klavaro is great software to learn to type the right way. It is customizable and works with multiple layouts and best of all, it’s free but only available for Windows. This next app is a typing tutor app which offers typing courses, tests, and games. It works on the web and doesn’t require any additional installation. You can even use the service without creating an account but you’ll need one if you plan on using their pro services. There are three categories of courses; Official, User-generated, and custom. Most of the courses are free on the web and you can play games while learning to type faster. 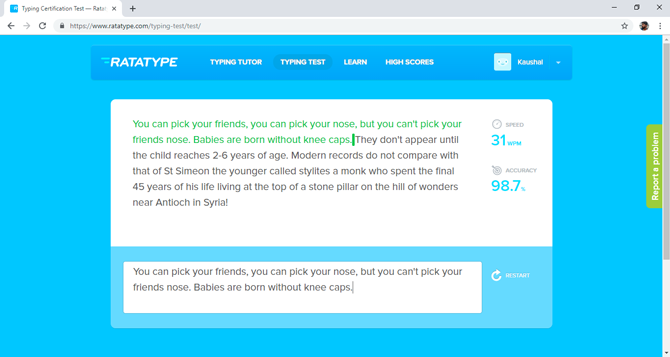 Typing tests are interesting, you can test your speed and accuracy based on one, three, and five minutes. The scores are generated and listed on the online scoreboard where you can see your ranking. Bottom Line: Typing Cat is an easy to use software for the web. It is great for children and adults alike. The free version is sufficient for most users but if you want the pro version, you can get it for $2.5/ mo or $9.99/yr. KAZ claims to teach you how to touch type in 90 minutes. It offers a number of software editions for different types of learners working in different settings. KAZ claims to use a Brain Balance method where sight, sound, and touch senses are used to accelerate the learning process. It is suitable for all children aged 6 years or more. You can take a self-test to see how much have you learned and compare results with previous reports. There are five modules or courses that you can take, a total of 4 hours worth of materials. Each module comes with animations, graphics, and games that are soothing to the eyes, and fun to play. This is meant to improve user experience and help with the learning process. There are a number of user guides available including several video tutorials. KAZ is available for Web, Mac, and Windows. It is also compatible with both the US and UK keyboard style. Bottom Line: It is a versatile touch typing software solution that offers a number of products and licenses across a number of platforms. There is literally something for everyone. 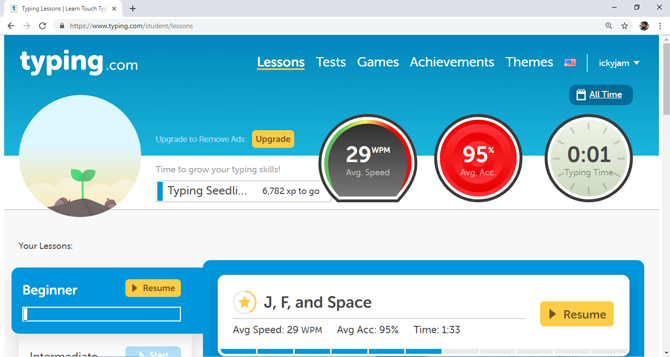 So, these were some of the best touch typing software to improve your typing skills. Some of them are cross-platform, so I recommend to use the one that is best suited to you. Learning touch typing takes time; anywhere from few weeks to months, but pays off in the long run. So, be sure to pick up one program and practice it over and over again.